The simple answer is: No. 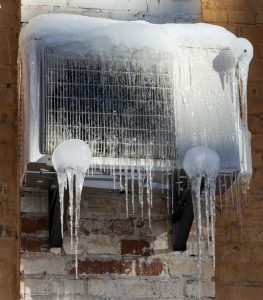 If you see ice forming on your air conditioner (probably along the indoor coils), turn off the system and call for repair services from our team right away. The AC needs to be fixed, and it’s a repair only professionals can correctly diagnose and perform. So, while you’re waiting for us to deliver you the Irvine, CA air conditioning services that will ensure you have a healthy air conditioning system, we’re going to fill you in on why ice on the AC shouldn’t be there and why it might happen. A reason to bring up the “ice on the AC is not good” topic is because it’s easy for a homeowner to think ice forming on the air conditioner is normal, even expected. The air coming from the vents feels cold, so maybe ice is a natural byproduct. But an air conditioner is a refrigerant-based system like a home’s refrigerator—and you know you don’t want ice forming in your refrigerator! The way an AC cools down a home is by moving heat from the house and depositing it outdoors. This is called heat exchange. The air conditioner circulates refrigerant, which evaporates inside the indoor coils and absorbs heat from the air, then condenses in the outdoor coils to release it. If the air conditioner is working correctly, this will not create any ice. Although the refrigerant is cold when it passes through the coil, it rapidly heats up past freezing as it draws heat from the air. When ice appears on the evaporator coil, it’s probably because something is wrong with the heat exchanger process and the refrigerant in the coil is remaining too cold. Since water condensation forms along the evaporator coil, it will turn to ice if the refrigerant is below freezing. One reason for a decline in heat absorption along the coil is because of a clogged air filter. The filter picks up enough dust and debris over one to three months of operation to significantly block air flow into the AC. With less warm air moving across the evaporator coil, the refrigerant temperature may stay too low. You can prevent this by regularly changing the filter during the year. The ice may also be a result of dust, dirt, grime, or mold along the coil. A layer of debris of any kind serves as an insulator blocking heat absorption, leading to ice development. Finally, and most seriously, ice on the coil can indicate a refrigerant leak. A loss of refrigerant makes it harder for the coil to absorb heat, and the remaining refrigerant will stay too cold. To repair this, technicians must not only seal the leaks but also recharge the refrigerant to factory levels. We have more than 30 years serving Orange County homes with the finest in AC repair and other comfort services. We understand you need to have your AC at your service all around the year, and we’re ready to see it receives the quality care necessary to be there when you need it. Saddleback Plumbing—Proudly Serving Orange County Since 1981! Call Saddleback for Fast Professional Air conditioning Repairs.